Using spirulina for autism is controversial. Although as a nutritional supplement spirulina provides many healthy nutrients, some turn to spirulina as a chelation agent for heavy metal poisoning, and on this use, more research is needed. Using spirulina as a potential chelation therapy aimed at removing toxins that cause or exacerbate autism has little scientific backing. The use of chelation therapy is controversial in autism treatment. Its use hinges upon the belief that the accumulation of heavy metals, especially mercury, causes autism. Chelation therapy is the use of chemicals or other agents to remove heavy metals from the body. Chelating agents bond to the heavy metals yet are water soluble. This enables the liver and kidneys to flush the chelating agent and heavy metals out of the body. It can have severe side effects. Today, conventional doctors use chelation therapy for acute and severe heavy metal poisoning. This may include poisoning by arsenic, lead, iron, mercury, plutonium, and uranium. The chelating agent is given to the patient through an intravenous solution (IV), an intramuscular injection or orally, depending upon the heavy metal present. Spirulina has been used as a chelating agent for arsenic poisoning ("Efficacy of spirulina extract plus zinc in patients of chronic arsenic poisoning: a randomized placebo-controlled study. ".Journal of Toxicology: Clinical Toxicology. 44.2 (March 2006): p135(7) as quoted in Spirulina article). Animal research has also shown spirulina to be effective against side effects of chemotherapy, further bolstering support for the theory that spirulina helps the body rid itself of toxins. 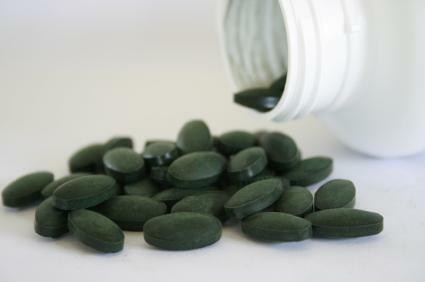 However, few if any research demonstrates spirulina as an effective chelating agent for ethyl mercury. There's still a lot of controversy among factions who declare ethyl mercury preservatives, vaccines, and other pharmaceuticals are safe, parents who believe that vaccines have hurt their children, and researchers who are still studying all sides of the issue. Suffice to say that there's probably no one cause of autism. Genetic predisposition, environmental exposure to toxins, and even bacterial and viral components are all being studied as contributors to this troubling disease. Many leading medical research facilities criticize the use of chelation for autism. Dr. Jay L. Hoecker, writing on the Mayo Clinic's website, says that "There's no scientific evidence that chelation therapy is an effective autism treatment." Spirulina, chlorella, and other blue-green algae are rich sources of nutrients. Some people use spirulina for autism to provide nutritional support. Essential fatty acids, such as GLA, ALA and many others. Many of the nutrients listed above are known to help cognitive function and support a healthy nervous system. B-complex vitamins, especially vitamin B12, are necessary for healthy functioning of the brain and the nervous system. Essential fatty acids are known to help proper brain function. For those who turn to spirulina, chlorella and other blue-green algae supplements to treat autism, benefits gained may not be entirely due to its chelating effect. The nutrients contained in spirulina, particularly the essential fatty acids, vitamins and minerals, may actually be helping any underlying deficiency that exacerbates autism or related disorders. Before giving your child spirulina or any supplement, please talk to your health care provider or a qualified nutritionist. While spirulina is considered generally safe for adults, its effects on children and potential side effects are not well documented. For dosage information in spirulina, please visit the National Institute of Health site which provides guidelines on using spirulina. What is Autism? - dozens of articles to help you understand autism in its many forms. Autism Myths - separate myth versus fact. Autism Symptoms Checklist and Autism Symptoms common symptoms of autism. For parents desperate to help their children, the promise of one single supplement to help their child is alluring. While supplementing with spirulina and other vitamins may help, seek a qualified nutritionist, natural health practitioner or naturopath skilled in working with autistic patients to help you determine the right amounts to take.